Victorian and early 20th century work to ‘restore’ and enhance churches is often criticised for being unsympathetic to the medieval fabric it has replaced. Fair comment, but this cannot be said of Campsea Ashe’s superb east window – another example of late Gothic Revival, and the enduring memorial to William and Alice Lowther. It was commissioned in 1912 by their sons and daughters (the eldest son being James William, 1st Viscount Ullswater of the High House), at the same time as the Presentation of Christ memorial window for the 5th Baron Rendlesham was being planned for installation in the Nave. The new East Window recently erected to the memory of the late Hon. William and Mrs Lowther, by their sons and daughters, will be solemnly dedicated by the Archdeacon of Suffolk at the morning service on Sunday October 20th . The window, which is a very beautiful one, is the work of Messrs. James Powell & Sons, of Whitefriars Glassworks, London. In the centre light is a figure of our Lord, with outstretched hands. 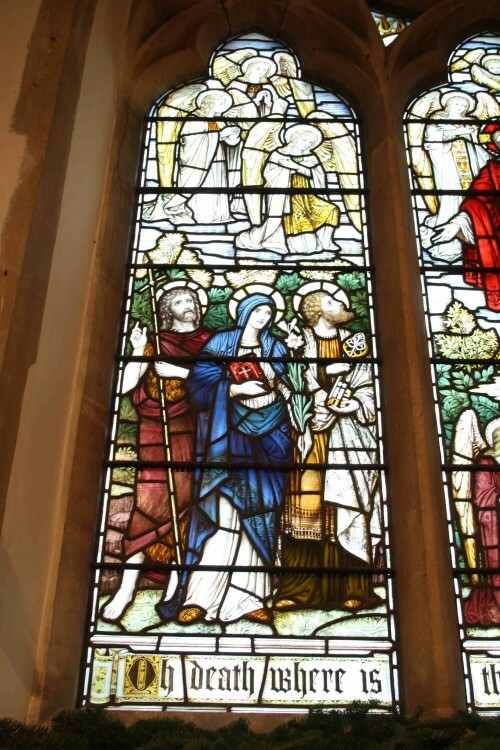 In the left hand light are seen St. John the Baptist (patron saint of the church), the Virgin Mary, and St. Peter; while in the right hand light are St. Hilda, St. Edmund, and St. Oswald, representing Yorkshire, Suffolk and Cumberland respectively, the Counties with which Mr. and Mrs. Lowther were so closely connected. The Coats of Arms are those of the Lowther family on the left, and the Wensleydale family (Mrs. Lowther’s) on the right. 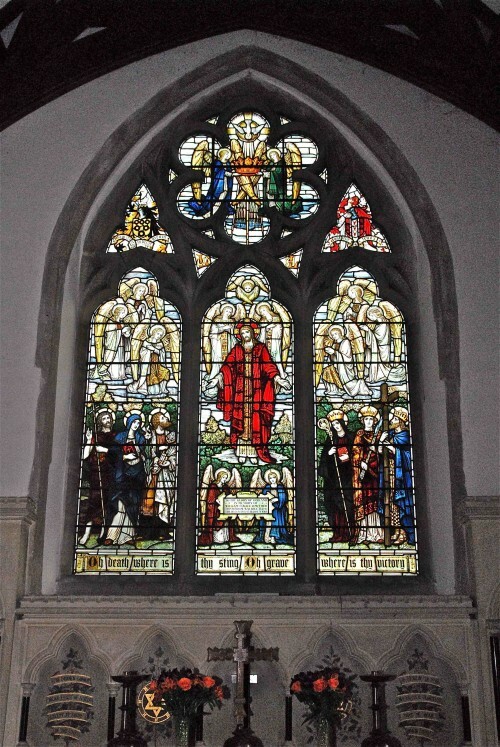 The principal stained glass figures in the window are surrounded by saints and angels in more subdued colour, and the Holy Spirit is shown in the form of a dove descending to Christ from the uppermost light. 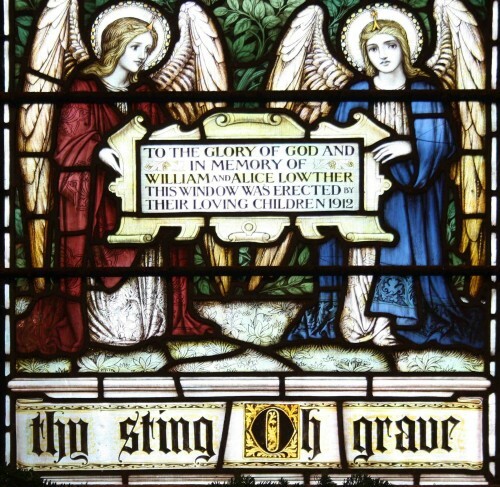 A small panel contains the dedication “To the Glory of God and in Memory of William and Alice Lowther this Window was erected by their Loving Children, 1912” and gothic text scrolled in the glass above the sill reads “Oh Death Where is they Sting; Oh Grave where is thy Victory”. In his history of the village, the Rev. Lucas expands on the lives of the three significant Anglo-Saxon saints depicted in the window, and it is worth paraphrasing these notes. St. Hilda (Hilda of Whitby) (614–680), Yorkshire born, was the daughter of the Hereric, nephew of Edwin, King of Northumbria. When she was about 30 years of age she adopted the monastic life and became Abbess of a small convent at Hartlepool, and later on of the famous Monastery of Whitby. She was present at the Synod of Whitby in 664 which ruled in favour of Rome’s religious doctrine over the rival doctrine of Celtic Christians and Columba’s Iona foundation – specifically on the customs for determining the dates of the Easter festival. St. Edmund, King and Martyr (841-870), was the son of the King of Saxony, but was appointed by King Offa to succeed him as King of East Anglia in 865. Defending his kingdom against the Danes, Edmund was eventually defeated and taken prisoner near Hoxne in the north of Suffolk, and on refusing to renounce his Christianity he was bound to a tree and cruelly executed by arrowshot. Before burial his head was cut off and thrown into a wood, where legend says it was guarded by a wolf. 33 years later the body was moved to Beadsricesworth (Bedric's worth) where Sibert (Sigeberht), patron of Westminster Abbey, had built the Church of St. Mary. This became the foundation of a great Benedictine Abbey Church and shrine, and in honour of the martyred king the site was renamed St. Edmundsbury in 925. In 1849 a very ancient oak tree at Hoxne, which tradition said was the tree to which St. Edmund was fastened, was blown down and an arrow head was found embedded in its trunk. St. Oswald (circa. 605-642) was the son of Aethelfrith, King of Northumbria. His father was slain in battle by Raedwald, King of East Anglia (said to have lived at Rendlesham, and believed to be revered central figure buried at Sutton Hoo). After very troublesome times, Oswald obtained the throne of Northumbria (which included Cumberland) and through energy and good influence his kingdom was converted to Christianity. He founded many churches and monasteries, and was renowned for his works of beneficence and charity.